Sadly, honesty and business don’t go hand in hand as often as they should. A lack of customer service, overcharging for goods, and manufacturers not standing behind their products; these are all symptoms of a poorly run business. The Motorcycle Industry surely isn’t exempt from these conditions. But it’s easy to appreciate a well-run enterprise when the customer service is exceptional, the prices are fair and the seller stands by his product. So much so, that you may even return and (gasp!) give them more business. The companies that fail to understand this will ultimately be defunct with time, but the ones that truly care about the customer will ultimately prevail. Happily, upstanding businesses do exist. 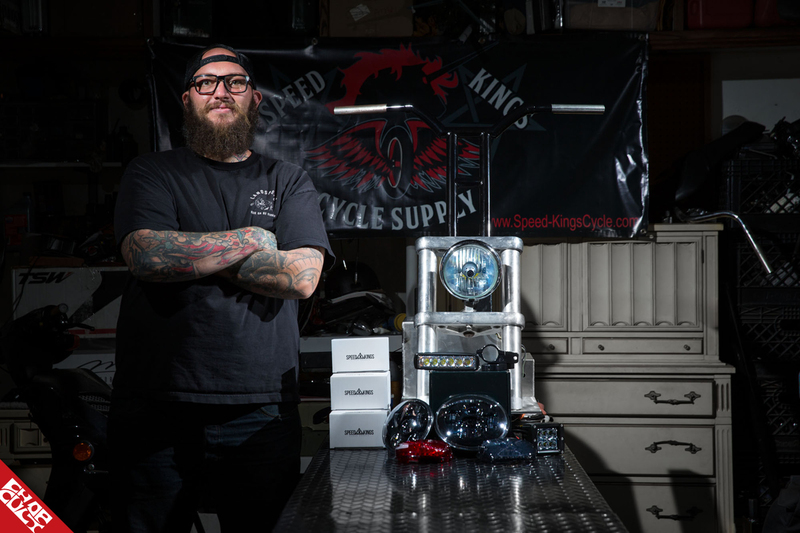 Speed-Kings MFG is definitely one of them. 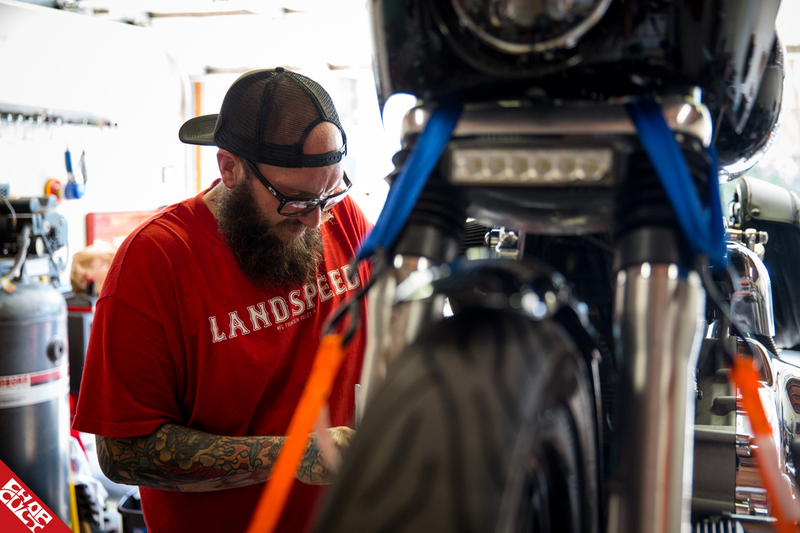 Over the course of a couple years of friendship with Stephen “Speed-King” Edgar, I have watched his business grow from him slinging a few small parts at the occasional swap meet into a larger internet presence. Stephen’s website now features a number of his own and other company’s products. The rapid expansion of his business happened in less than a year and it wasn’t by fate. Stephen’s a hustler; he provides products that people want. He stands by his product and his eagerness to treat his customers the same way he would want to be treated is his main initiative. Simple. The phrase, “It’s not what you know, it’s who you know” rings true through many aspects of life. In my profession it is paramount. When I was first introduced to Speed-King Steve, I had no idea what kind of influence he would have. 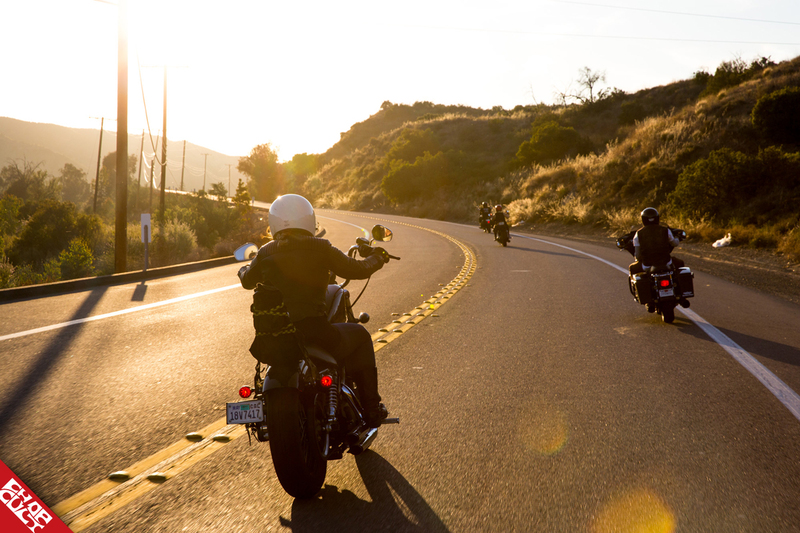 Through him, I was introduced to many other people with whom I have shared many good times on two wheels. He’s a humble person, who looks out for those he considers friends. It’s easy to see how that attitude translated into his successful business model. For those who don’t know, what is Speed-Kings? Speed-Kings Cycle Supply is a little dream of mine. It’s my idea for offering and creating parts for motorcycles. I always envied those people who had that really cool job within an industry they loved. So, I started to create my own. 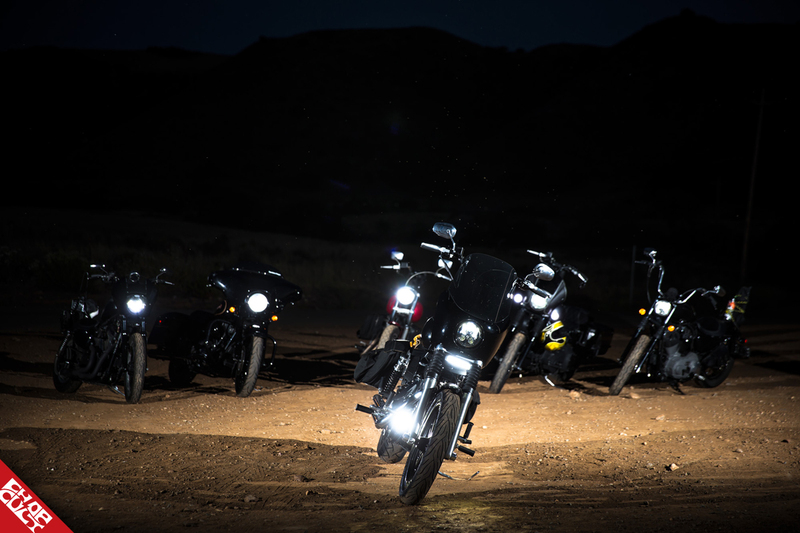 We offer after-market parts for your motorcycle needs and, as we grow our line of products, the companies we work with grow with us. What was the driving force behind wanting to start Speed-Kings? 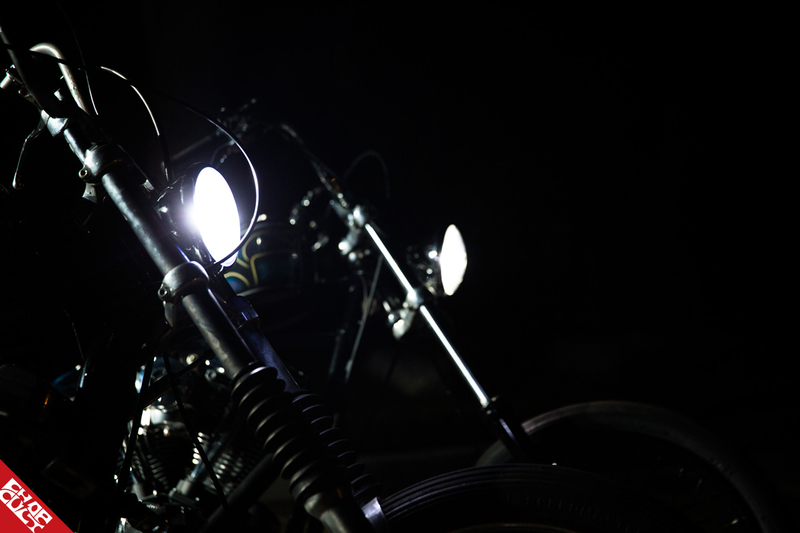 I started Speed-Kings while I was building my first Harley, a 1969 Ironhead chopper. I designed a few parts and started manufacturing them. I did it in the hopes of helping me to afford to buy some parts for my build. At that time, I would sit in the garage, chain smoking, and chewing Copenhagen wintergreen ‘til 5 in the morning. Making parts by hand with a cut off wheel, a file, and an idea. Never thinking it could be what it has become. What got you into motorcycles and choppers? I have been around motorcycles forever, dirt bike riding as a kid. I grew up in Hesperia, CA. We had all sorts of desert to ride. I got involved with Harleys in my late teens working at Daytec Center as a machinist. I was in love, but at that time I could not fathom affording one. Years later, my friend Kevin let me ride his 1981 Ironhead chopper he built. I was forever hooked. I scraped all my money together and bought my first Harley. From Dynas to Panhead's, I love them all. 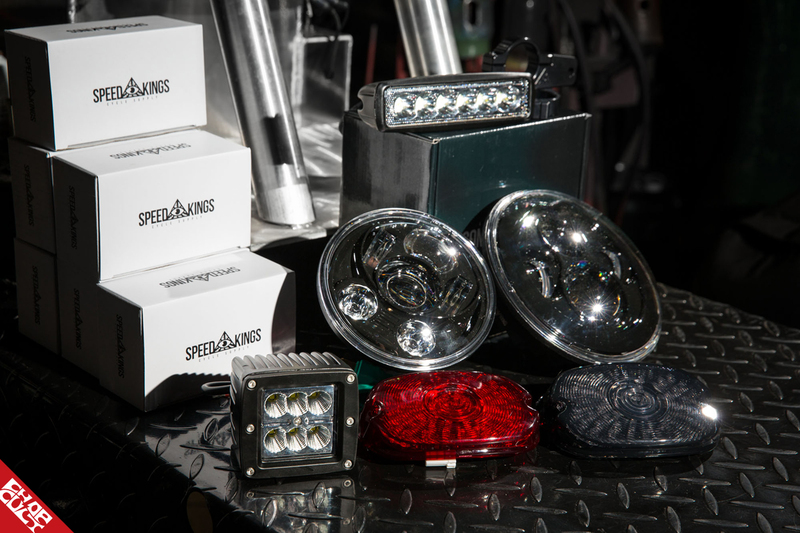 The lighting aspect seems to be a major driving force behind Speed-Kings, what are some of your personal experiences in using upgraded lighting? 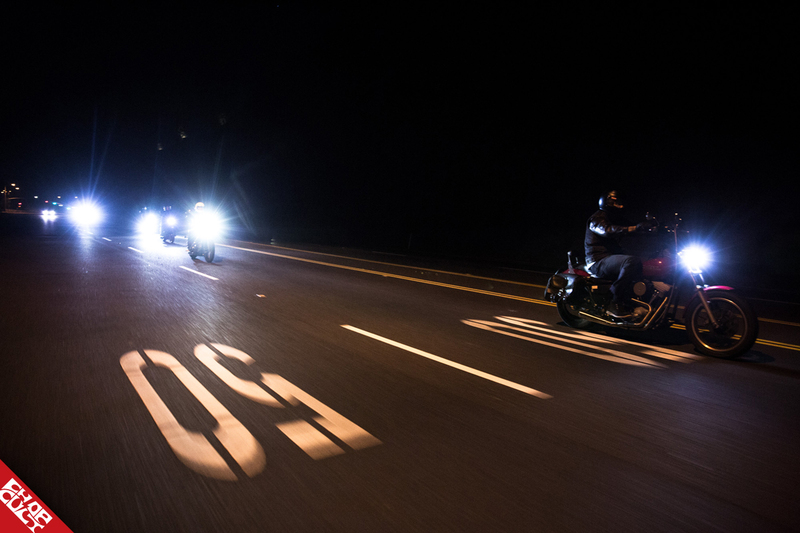 With riding at night on Southern California freeways comes construction, which leads to traffic. So, it is safe to say I do a lot of night-time lane splitting. Having some bright lights shine in these cage mirrors while they are updating their Facebook status to "Annoyed, traffic again" really helps them notice you are there. 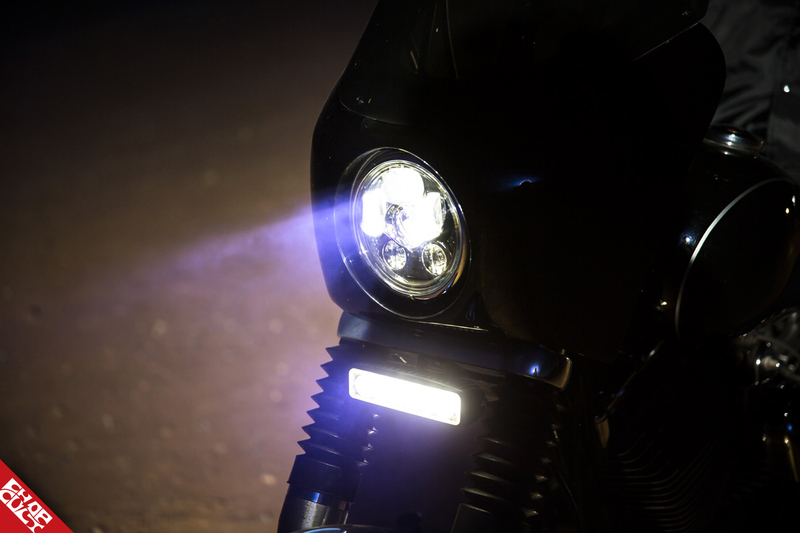 These lights are not just bright and make it easier for you to see, they make it easier to be seen. That's a very valuable tool in a world full of cages not paying attention. In the end, though, my favorite personal stories are those of my customers. When they think it’s going to be bright, and they turn it on for the first time, and really see how bright it is. 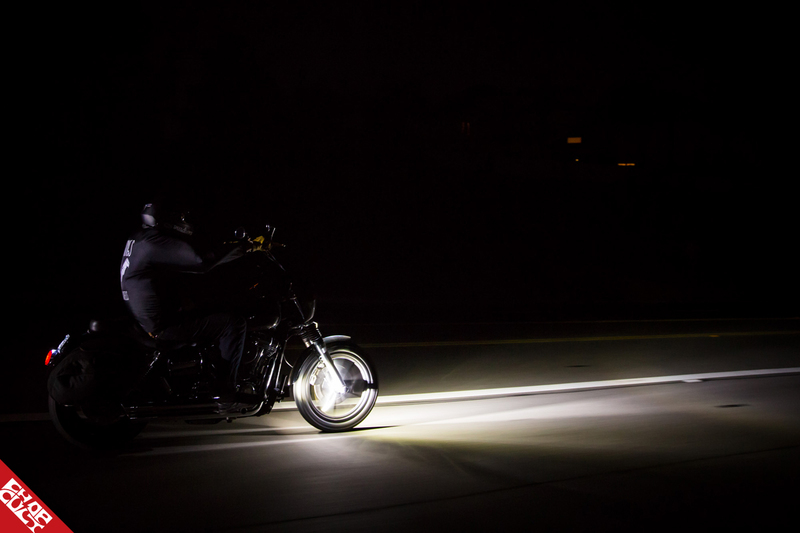 I love to hear the feedback, and how much they love the lights, and how it has changed their riding experience. There seems to be a wide array of applications for some of your parts. 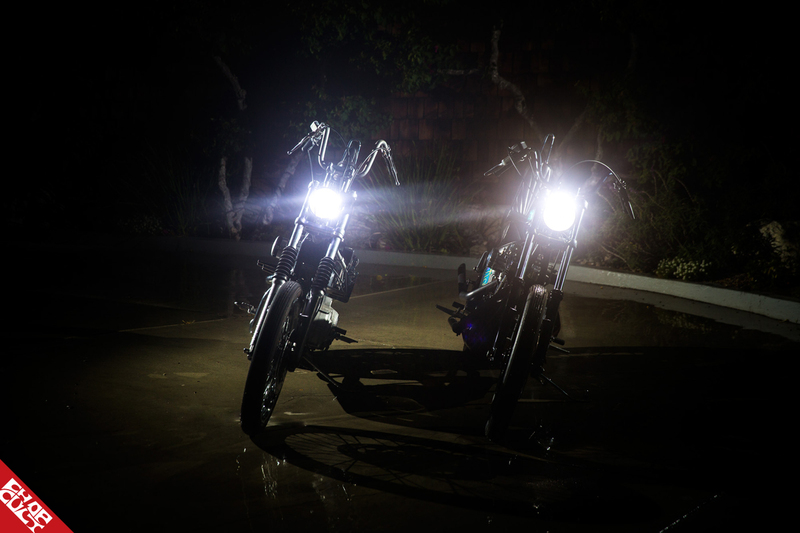 Some people might argue that upgraded lighting has no place on a chopper, where and how have you seen your parts used? I have seen our lights on just about everything. I personally have my 7" Sunlight Creators installed on my 1972 Ford Econoline. I love seeing them on choppers. It’s funny how some people's minds get stuck, though, and how they want to stay period correct. Give it their first night-time accident and they change their mind after that. 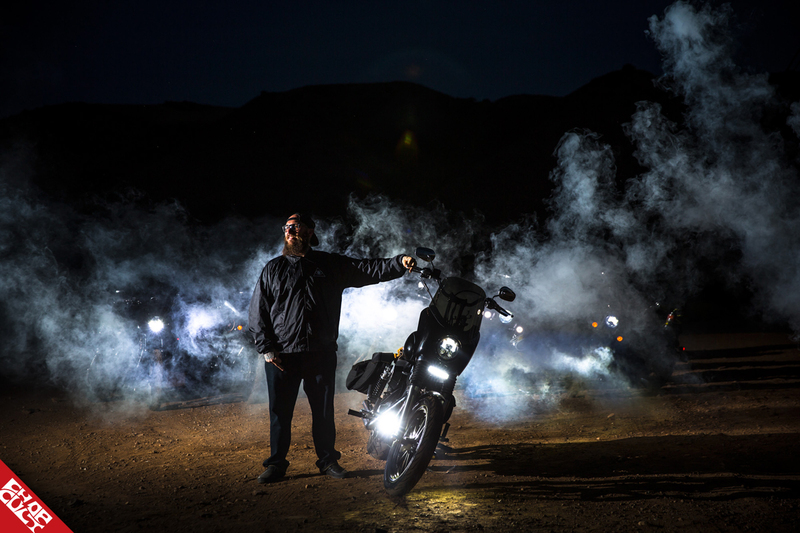 How’s the modern landscape for up and coming parts manufacturers and distributors in the motorcycle/chopper world right now? I can’t really speak for anyone else and what they get out of it. I can only speak for my own journey. I believe in treating all my customers how I would like to be treated if I were in their shoes. I believe you get out what you put in. I treat my customers like family. I will go out of my way to make sure they are handled. I always will. I appreciate each and every one of them. Got any plans for events or rides coming up? Currently, my plans are to go visit my longtime friend, Paul Stanley, in Vegas for the Barrio Bowl. That's always a great event. Plus, I love downtown Vegas. I do finally have plans to make the journey for EDR next year. We will see, as that gets closer. I am sure I will pop up at other rides and events as I free up. What can people expect next from Speed Kings? Right now we are working on a secret project, it’s too soon to release details on that. Working on another couple handlebar designs as well. As we grow what we offer our customers, we’ll continue to expand. Something I always wanted to do, growing up, was have my own clothing company. So, here and there, we will be dropping small runs of shirts, hoodies, and jackets. Check out Steve's world: Website, Store, Facebook and Instagram. Article and photography by Ryan Loughridge. ** Steve has graciously offered a 5.75" Sunlight Creator V.2 for us to give away through Instagram.